The Finnish word ‘takapotku’, which means a ‘sudden backward motion’, may have seemed like a bad omen for the faculty of the online Nordic Go Academy, who took the top three spots at this tournament in 2011. No such backlash occurred, however; they finished in the same three spots again. Here’s the story. This year the tournament schedule was moved back from its traditional February slot to June 16-17 (perhaps that was the backward motion). It was held at the New Student House at Helsinki University. 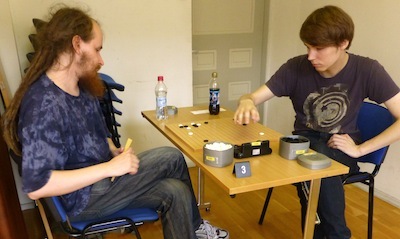 Fifty-five Finns, nine Russians, and four players from Sweden, France, and Estonia took part, and over half of these 68 contestants had dan rankings. They played five McMahon rounds, the 4-6 dans being placed in the top group and starting out with 35 McMahon points. Just one player got through the five rounds undefeated. That was Mikko Nevala, a 3-dan who hails from Oulu, the gateway to Lapland. Since he started with only 33 McMahon points he did not win the tournament, but he finished a highly respectable 8th, ahead of ten higher ranked players, three of whom he beat in direct competition. So who won? The top McMahon score of 39 was shared by four players, each of whom had won four games and lost one. Three of them were the NGA faculty who, as they had last year, tied themselves up in a trefoil knot, Juri Kuronen beating Antti Tormanen in round 3, Su (Jeff) Yang beating Juri in round 4, Antti beating Su in round 5. The fourth player in the MM-39 quartet was the veteran Russian Alexei Lazarev, who lost to Su in round 3 and was not paired against Antti and Juri. 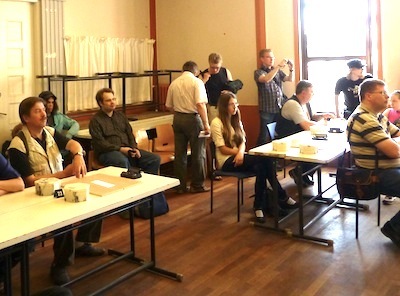 The tie was broken by SOS points, of which Su had 192, Antti had 191, Juri had 188, and Alexei had 187. Su also won this tournament in 2008 and 2011 and Antti won it in 2010. Full results are here. A recent interview with the winner Su Yang can be read here. Antti’s side of the story, with photos, can be viewed on his blog here. There are more photos and comments in an article entitled ‘The winner was decided by a toss’ on the Petrozavodsk State University news and events page here.